« Seeds: How many do you need? I am often asked how much space it would take to grow all one’s food. That depends on a lot of factors. I can only address the issue from the sustainability of also growing all the compost crops to feed back the soil. With the world population now topping seven billion, using the least area for this project is high on the list of considerations. Limiting your diet to only what you could grow in the least area, sustainably, brings nutritional challenges, with the most limiting nutrients being calories, calcium, and protein. Those can be met with careful planning, however the resulting diet may or may not be something you want to eat everyday at this time in your life. This is exactly what is studied at the Intermediate level of GROW BIOINTENSIVE® Sustainable Mini-farming. The basic information for GROW BIOINTENSIVE can be found in How to Grow More Vegetables by John Jeavons. The USDA has interactive diet planning information at http://www.choosemyplate.gov/. You can find the nutrients for specific foods there. According to the SuperTracker feature, at a moderate rate of exercise, I should eat 2000 calories per day. The number of servings from each food group is suggested to reach that goal. However, limiting myself to only my garden, I won’t have all those food groups available. A GROW BIOINTENSIVE 2000 calorie diet might look like what’s in the box on the right. It’s a vegan diet and includes no vitamin B12, a critical nutrient necessary for healthy nerves and to prevent anemia. As with any diet, there are other nutritional considerations. You would need to eat this amount each day to reach 2000 calories. If you get pretty good yields, you could probably grow this amount of food for one person, along with the necessary cover/compost crops in about 3,800 sq. ft. of bed space, including compost piles, in zone 7. I know that vegans often use supplements to get what is missing in their diet. Personally, I believe in getting all my nutrients in the food I eat, the way Mother Nature intended. The food contains the nutrients in balance with other things necessary for assimilation in our bodies. Most likely you would want to expand on this diet. Chickens are becoming pretty popular, even in city backyards, and would help with that B12 deficiency. If you are considering the total ecological footprint of your diet, you would have to include the area your chicken’s food came from, including everything it went through from farm to you. Pasturing your poultry helps, but most people buy in the grains they need. 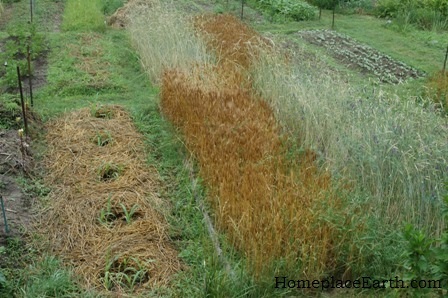 You could grow your own and then use the straw and stalks for bedding before it all goes to compost. Harvey Ussery has been working on some ideas for additional homegrown feed, including worms and soldier fly larvae. He wrote about it in his book The Small-Scale Poultry Flock. The Resilient Gardener by Carol Deppe is another book of interest that takes a close look at growing much of your diet. Then, of course, there’s dairy. Cheese, yogurt, and other products are pretty nice to have, but they come at a cost of widening the ecological footprint. And so it goes for each addition. You could drive yourself crazy worrying about every detail. I worry when people drop whole food groups from their diet. I believe we need to feed ourselves from a variety of foods available seasonally and as locally as we can. This does much to lessen our footprint. Chickens could be raised for eggs, with the young roosters and old layers for meat, taking the place of the broiler industry. Limiting our beef consumption to the young steers and old cows from the dairy herds could do away with the sorry feedlots the current beef industry now maintains. The amount of these animal products and the way we eat them would have to change, but change needs to come anyway. Our local newspaper just had an article about a family with 13 children, including four sets of twins, who were born between 1954 and 1974. Reminiscing, one pair of twins talked of the large family garden, fruit trees, pigs, chickens, and hunted deer that fed their family in those days. If their memory serves them, one season all their parents bought was salt and pepper for the table. That is impressive. I’m sure all of them were involved in growing that food. I have a feeling that a lot of you would like to do the same thing. Maybe you can, but if you haven’t been brought up with those skills, there’s a lot to learn. Some people want to grow all their own food out of fear for what the future holds. Remember, we are not alone in this world. Furthermore, everything is connected. We need to recognize that interdependence and build upon it. It is in building our communities that we can develop a resilient food system that will feed everyone. Most likely, as you go about becoming involved with the people in your community, you will meet just the ones who can teach you the skills you lack. 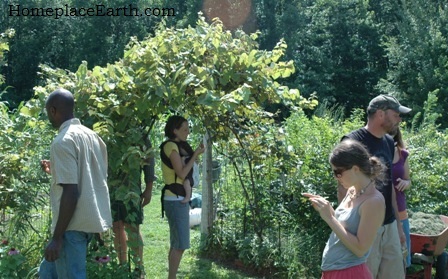 Permaculture ethics call us to care for the earth, care for the people, and return the surplus. Each of us has talents we can use to strengthen the network within our own communities. If our talents and resources allow us to grow more food than we can consume ourselves, we can share, barter, or sell the surplus within our community, building strong ties with others and expanding our own options. Fear can be crippling. We need to act out of love for the earth and each other. In acting out of love, fear falls away. Once again, I’m working on Homegrown Fridays. That’s when I eat only what I’ve grown on the Fridays in Lent. I grow a lot of food, but not all we eat. I often think about what would be involved if I did. Just as with communities, in our gardens we need to think in whole systems. There should be no waste because excess from one operation would be a resource in another. Your permaculture garden would have more than just vegetables. There would be a hedgerow with filbert trees and berries, grapevines growing overhead, mushrooms in the shady areas, and beehives. There are many ways to add food and shrink your diet footprint. If you are building the soil as you grow, you can provide your family with more nutritious food than you can get anywhere else. Buying from local producers what you can’t grow provides your family with a safety net that is only available within strong, resilient communities. Great article – I’ve tweeted a link to this page. Glad you like it. I’ve had it on my mind to write this for awhile now. Nicole, if you read through my the other posts you will find that I often mention books or links. On my website at http://www.HomeplaceEarth.com there is a resource page with helpful books and other information. I used to own a tiny farm in Central Mexico and thanks to my permaculture training, I was able to grow most of my own food (and sell the surplus), collect rainwater, etc., but what I’m most proud of is the permaculture/sustainable community development projects that I was involved in. My sis and I are 2 old ladies that are just developing our sustainable farm. We have 6 acres. Our livestock includes call ducks, Americauna chickens, Babydoll Southdown Sheep, Pygmy Goats, Red Waddle pigs, Toulose Geese, Naggasett Turkeys and we are eagerly awaiting our Dexter Heifer later this year. We have a 7 year old boy that lives with us and is in 4H Clovers. I am so glad to have discovered your blog with the help of Moth Earth News. I will be reading often. Debbie, I’m glad you can be along for this journey. It sounds like you have a busy homestead. I was in 4H when I was growing up in Ohio. We had a cow for about seven years when the kids were all at home. I milked every morning and let the calf in with her during the day. I penned the calf separately at night. That way if we had to be gone, we could just let the two in together and the neighbor didn’t have to milk. I just found your blog in a Mother Earth News Article. Nice blog! Linda, glad you can join us.